In our last post on Beating the Injury Mindset I mentioned several running alternatives. Foremost among them is the elliptical machine. In this article, I’ll outline the pros and cons of using the elliptical. I will also provide a few sample workouts. 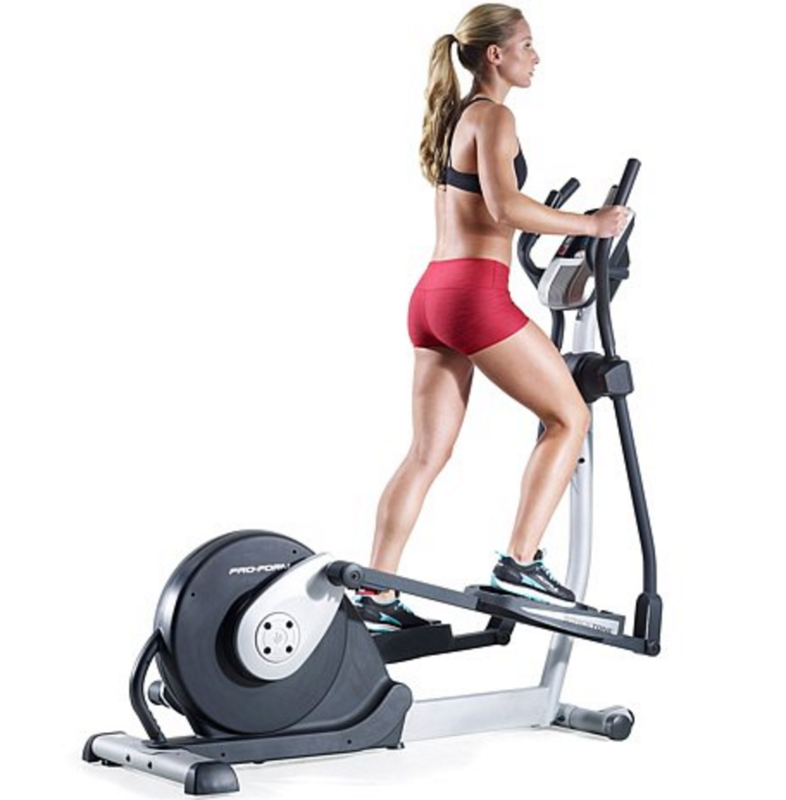 Elliptical machines are in almost any gym, anywhere. You have definitely seen it before. It has the footpads you stand on, connected to what appears to be a bicycle crank. There are two handles you can hold onto that move in unison with the pedals. And this is all stacked up in front of an interface that allows you to control your speed and resistance. It’s right next to the treadmill area. This is a convenient reminder that the elliptical machine is a great running alternative. The elliptical machine is as close to running as you can get without the impact of running itself. Of the three Return-T0-Run phases, the elliptical is a Phase Two exercise. It is not total rehab work, but it is not complete running. What makes the elliptical a good alternative as you return from injury? First, it is as close to running as you can get. You’ll be moving through the full stride and working on firing your run muscles in the right patterns. Second, you will get a great workout. This is in direct contrast to the foundational work you have been doing as part of your rehab. If you have been injured, this will be your first taste of what running feels like. And it will be powerful. Tip: Be sure not to get carried away your first time on the elliptical and go too fast or too long! What are the downsides of the elliptical? Shortened Stride – You will not have a completely dynamic stride. The footpad placement and the arc within which they move is fixed. Your foot will not fully go out in front of your body. It will also not fully extend behind you to maximize your glutes. Lazy Hip Flexors – A huge part of running is actually listing the knee up (to move the foot forward). On an elliptical machine your foot remains next on the footpad; the machine does the lifting. It operates like a bicycle crank. By pushing down on the left foot you will automatically lift the right foot. What makes the elliptical machine excellent for learning the mechanics of running can at some point become an limiter. Reduced Core Stability – You count on your Glute Medius to stabilize the hips while running. The elliptical machine makes it easy to overweight each step as you move. Especially if you use too much resistance. Shifting the hips from side to side prevents the Glute Medius from properly firing. Since this is required for proper running, don’t overdo the resistance. How does the elliptical fit into your return to run progression? Early in your rehab you’ll be walking a lot. More than you have ever wanted. When you are ready for the elliptical machine, you will warm up with a walk and then spend some time on the elliptical. At this time most of the elliptical work will just be steady/light aerobic work. In the middle of your rehab, you will be on the elliptical machine. There’s no need to warm up elsewhere, you can do so on the elliptical machine and get right to work. Your sessions will be in the 30 minute range here. In the final stages of the transition to running the elliptical machine is your warm-up. You will start there to get the muscles firing and activate your core stabilizers. Then you will transition to the treadmill for proper running. Depending on your program, you might return to the elliptical to cool down. Over time you will move completely to travel and/or outdoor running. Treat the elliptical like a real run workout. Do not bring your iPad or magazine to read. Bring hydration. Bring a towel or paper towel with you to the machine for your sweats (yes, you get to sweat!). Have a workout plan. Know exactly what you want to do and what the intervals are so you can get it done. This will also help you increase the workload from week to week. You can move from two minutes of faster intervals this week two 2 1/2 minute intervals next week, Etc. Use speed and resistance settings wisely. Speed operates like a treadmill. It determines how fast your feet will move. Resistance operates like a stairmaster. It determines the force you have to press against at the front end of the elliptical machine foot strike. At the beginning we recommend keeping the resistance low so you can get used to the balance and dynamics of running. As you get fitter and you are looking for more work without more speed, you can begin to use the resistance factor. Warm Up: 10 minutes of walking with good form (treadmill). Main Set: 15 minutes at Aerobic Effort (Think 4 on a scale of 1 to 10). Cool Down: 5 minutes of walking. Advanced Modifications: Break the 15 minutes into 5 x 3 minute intervals. Then introduce some resistance: 2.5 minutes aerobic + 30 seconds with resistance, etc. Warm Up: 10 minutes of increasing speed (easy to aerobic). Main Set: 15 minutes of intervals. 30 seconds at high speed, with 60 seconds recovery. Repeat. High Speed = 8 out of 10; Recovery = 4 out of 10. Advanced Modifications: Reduce the rest intervals each week until you are at 30 seconds fast with 30 seconds of recovery. Main Set: 15 minutes with Resistance Intervals. Climb 1 minutes, Recover for 2 minutes. Repeat. Simulate a climb by increasing resistance slightly every 20 seconds of the “Climb” segment. Return to original resistance for recovery. Advanced Modifications: Increase the duraction of the climbing interval. Keep recovery at two minutes so total workout time doesn’t increase. The elliptical can be a great tool for your return to running if used properly. If you have a story or experience in using the elliptical with your training, please share with us in the comments below. Thanks for reading and good luck with your return to healthy running.